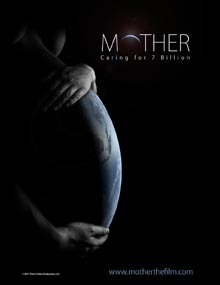 Synopsis: "Mother, the film, breaks a 40-year taboo by bringing to light an issue that silently fuels our most pressing environmental, humanitarian and social crises - population growth. In 2011 the world population reached 7 billion, a startling seven-fold increase since the first billion occurred 200 years ago. "Mother: Caring for 7 Billion" features world-renown experts and scientists including biologist Paul Ehrlich, author of The Population Bomb;" economist Mathis Wackernagel, the creator of the ground-breaking Footprint Network; Malcolm Potts, a pioneer in human reproductive health; and Riane Eisler, whose book The Chalice and the Blade has been published in 23 countries." Film series sponsored by the Susan B. Anthony Institute for Gender and Women's Studies, The Little Theatre, and the Multi-Media Center. Email sbai@rochester.edu for more information. Film is free and open to the public.